Welcome to the month of November!!! Can't believe 2014 is almost over already! I think I can safely say this year went by pretty quickly but I pretty much enjoyed it! So this November, we are launching a new Course: the Short Course in Jacket-Making and Trousers and running the last Stream of the Foundation Course in Fashion Design for the year! Well you will essentially be creating a "trouser suit" - which is really what the jacket and pair of trousers is. So we will be teaching the basics involved in creating a tailored jacket and a pair of trousers - right from taking the measurements, to creating the pattern and actually sewing both items - focusing on proper finishing. The Course will begin on the 26th of November, 2014 and will last for 1 month. Classes will take place on Wednesdays & Thursdays at the Training Center in Surulere, Lagos from 12 noon to 5pm. It is going to be pretty intensive as there is a whole lot to do in the allocated time so do come prepared! The Course is open to anyone who can already sew. It is, therefore, unsuitable for beginners who have no prior knowledge of sewing. Also please note that this is a womenswear course and we will, therefore, focus on making ladies' jackets and trousers. 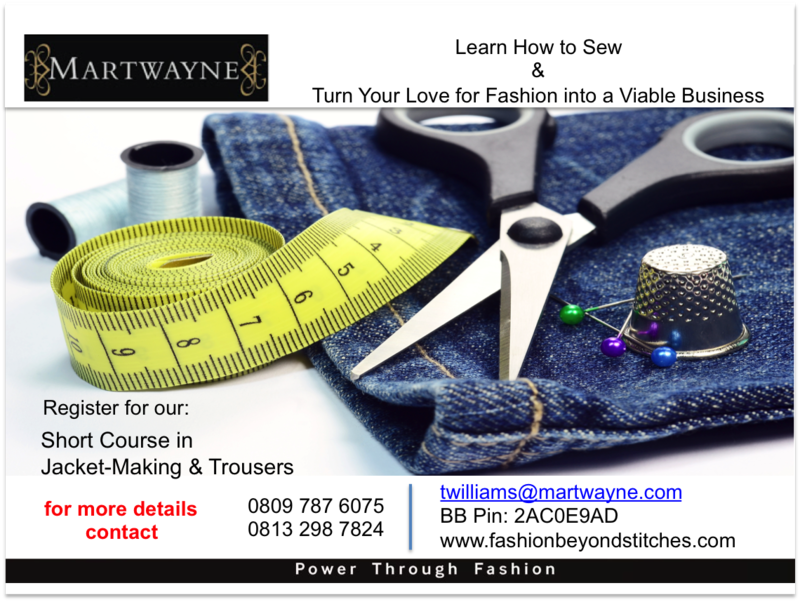 The fees are N25,000 and you will need a basic toolkit and fabric. Since the Course is for those who already sew, I am guessing you might already have some of the items required in the toolkit such as pattern paper, T-Square, etc. But from experience, people do prefer us to assist with getting their toolkits due to time constraints. If you would like a toolkit, this will cost an additional N3,500 and should be paid with the course fees. Please note that the toolkit will exclude your fabric, lining, buttons, a roll of matching thread for the fabric and interfacing as I am certain you would like to use fabric and similar materials of your choice. Suitable fabric for the project will be discussed during the Course. As always, payment of the fees into the "Martwayne Dynamiques" account, 101 223 3897 at any Zenith Bank Branch secures your seat on the Course. The last Stream of the Foundation Course in Fashion Design will begin on Saturday, 29 November, 2014. The first class, as always, is a Rerun of Volume 1 of our Fashion Entrepreneurship Course. Great! So I am trying to ensure my posts are shorter so hopefully I have been able to capture the details of the Courses. Here's me wishing you a great month and we look forward to you joining us this November. We might be able to make a plan for next year. If it does happen, I will upload the information on the blog. I'm so sad cos I'm not based in Lagos, is there any difference between pattern paper and tailors manilla paper? Do you sell them? No there is no difference. They are the same thing. Other call it brown paper. We also do not sell them but get them from the market. Re not being in Lagos, who knows, perhaps something might come up where you might be able to benefit form the Course. If we do make a plan, we will keep you posted. this hurts bad. y dont u have web seminars for we that cannot attend due to location. i stay in kd. Hello Nkem. Don't worry it is work in progress :-) We will keep you posted! Hello T, i was going to attend the course in December but stuff got on the way and i couldn't make it, I even bought the items you asked to get for the training. I am really looking forward to the next one. Oh great! I really look forward to having you. We should be having another one soon. Will keep you posted on the blog.